Coming off his worst season since, well, ever, Todd Helton’s name has come up in a few trade rumors this winter. The Angels pursued the hardest in December, but Bill Stoneman and Dan O’Dowd couldn’t work out an amicable money and player arrangement. Clearly, it’s not easy to unload a 33-year-old with six years and $90 million left on his contract. 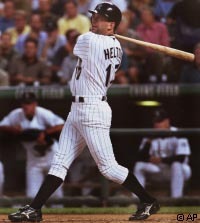 Saturday morning, reports surfaced that the Rockies and Red Sox are in trade talks for Helton. There is so much standing in the way of this deal, so my guess is that it is going to happen. The first obstacle: Helton’s no-trade clause. He supposedly likes playing in Colorado (which should say something about him), and might not be welcoming of a cross-country move to a much tougher fanbase. The second obstacle: finances. If the Red Sox are to acquire Helton, Colorado will have to assume a good portion of his remaining $90 million. After all, the Red Sox “can’t do certain things that on paper would look good without thinking about the ramifications on future payroll, on future construction, etc.”. With the costly additions of Daisuke Matsuzaka, Julio Lugo and J.D. Drew, it appears the Red Sox are nearing their arbitrary payroll limits. That could certainly be the best lineup in the game, rivaling that of the 2006 Yankees. The cost to the Red Sox, reportedly, would be right-handed reliever Craig Hansen and two additional minor leaguers, though the compensation could change depending on the financial arrangement. The consummation of this move would make the Red Sox the clear favorites in the AL East. That would be a pretty damn good lineup, but if Helton ends up going to the Red Sox, I would really expect a season pretty close to the one he had last year. When you compare his career statistics away vs. home, it really is striking – as it is for pretty much every hitter. But even if he goes for 20 HR, .300 AVG and .400 OBP, the lineup would still be nasty. But I would definitely make sure the Rockies eat a decent amount of the contract. He is not worth anywhere near $15 mil a year. I just don’t understand the logic in trading him right now, when you’ll likely get a quarter on the dollar. Unless, as Ken Rosenthal points out, they truly think Helton is done.